If you don't see an FAQ listed for your specific question, you may submit a User Submitted FAQ to the Great Lakes Region. All FAQs will be reviewed and then decided upon if they should be displayed or not on the Great Lakes Region website. So feel free to submit your User Submitted FAQ now! 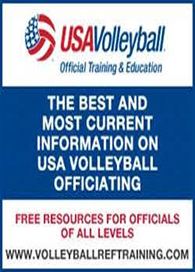 Publications Where can I find a form for... Forms and Publications pertinent to a specific group can be found by clicking on the appropriate volleyball icon (Juniors, Adults or Officials) and then choosing the Forms link. For the Region ByLaws, Handbook and Tournament Directors guide along with Corporate documents select the Region Info icon. Adults How many Liberos can be used in a match? Up to 2 liberos may be designated on the lineup sheet at the start of the match. 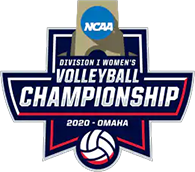 1) If zero or one libero is designated on the lineup sheet, the coach may select a different libero for subsequent sets but may not have 2 liberos. 2) If two liberos are designated on the lineup sheet at the start of set one, no changes to those liberos can be made during the remainder of the match. Tournament Directors Can a team be eliminated from playoff contention on the basis of points? NO. Teams advance to the playoffs based on the following criteria: 1. Matches Won/Lost Record (if playing matches) 2. Head to Head Competition. 3. Set Percentage. NOTE: Exception to this rule is made at certain events when time is an issue and tiebreaking procedures have been posted ahead of time. Tournament Directors Can a semi-final or final consist of only 1 game? Unless another format is agreed upon by both captains, all finals and semifinals must be 2 out of 3 Match. All rally score, first 2 sets to 25, deciding set to 15 must switch at 8 pts. No cap on any of the games. Adults Are 01, 02, 03 etc. legal jersey numbers? NO. Numbers 1-9 must be single digit numbers. 00 is still NOT a legal jersey number. Adults Can you wear sweat pants while you are playing? Sweat pants are allowed during cold weather. If more than one player is wearing sweats they must be the same color. Adults Where can I directions to a tournament? You can get directions from the tournament director, the site, or team rep. Tournament Directors Must a court have lines or will a contrasting outside border be ok? All courts must have 2" lines to delineate the court. Adults What if my team fails to officiate when scheduled or leaves the tournament and was supposed to officiate the play-offs? You are fined $100.00. Adults How are the adult team seedings determined? Adult teams are seeded based on pool play and playoff results. See the adult team seeding rules for detailed information. Adults What is the format for tiebreaker games? All tiebreakers or play-off games will be 1 game to 25 points. Rally score, no cap and switch sides at 13 pts. Adults What are the formats for pool play? Adult 4 team pools will play 3 games to 21 points unless otherwise noted by the Tournament Director. 5 team pools will play 2 games to 21 point rally score unless otherwise noted by the Tournament Director. Adults How do I start a team? Contact the Region Office at greatlakesvolleybal@glrvb.com for instructions on setting up an Adult Team. All registrations are now being done via the National Online registration program. Instructions for registration can be found on our main page. Adults Whose responsibility is it to provide whistles for officiating pool play in adult tournaments? It is the players' responsibility. Juniors Where can I find the web site for a specific Junior Club? Under the "Junior" icon select Clubs, if the Junior Club is listed in red and underlined - click on the club name to go to their specific website. Juniors Where can I get an entry form for Nationals? All National Entries must be submitted through the Advanced Event Systems. A link to this system can be found under the Juniors icon on our website. Juniors What is the format for tiebreaker games? All tiebreakers or play-off sets will be 1 set to 25 points. Rally score, no cap and switch sides at 13 pts. Juniors What is the "regulation" size for numbers on the front and back of shirts? And is there a limit to the size of the logo on the front of the shirt? Minimum size for the numbers is 4" on the front and 6" on the back. Recommended is 6" and 8". There is no size limit for a logo as long as it does not affect the visibility of the number. Juniors Who needs to have background screens? 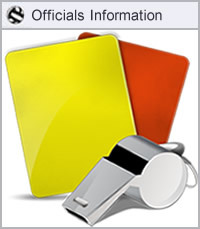 Background screens are required every 2 seasons for ALL adults (18 or over) affiliated with a Jr Club as well as all officials and official candidates. All directors, coaches, chaperones, managers, board members etc must submit to or have a current USAV background search in force to be affiliated with a club . Region Info Which states are included in the Great Lakes Region? Great Lakes includes Illinois- from the Springfield area to the south, Wisconsin border to the north, Indiana border to the east and the Iowa border to the west. Adults What is the region policy if an adult team only has 4 or 5 players at the beginning of the day? May a tournament director allow them to play but count all those matches as forfeits for that team? The official policy is that they are not allowed to compete! However in the spirit of the game so that other teams do not lose matches that they were expecting to get - the tournament director could allow the matches to be played if the OTHER teams agree but are counted as forfeits. Juniors Do you offer a beginning volleyball class for 7 yr olds? Several clubs have programs called "Volleykids" for the early age kids. Check with a club in your area to see if they offer such a program. Our competition ages go as young as 10 and under. Juniors How do we register for the tournaments in the Great Lakes Region? Do we contact the tournament director specifically or is thier a registration tab on the website? Contact the tournament director directly for info on any event that your are interested in entering. By clicking on the individual tournament on our tournament list in either Juniors or Adults - all of the contact info including entry fee is listed. For adults you may use the online registration form provided under the Adult Info link. 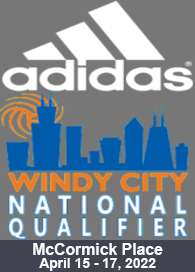 To register for Windy City Power League, registration can be found in AES. Juniors What are the formats for pool play? Pools with four teams should either play 2 sets to 25 points or a full match where the third set is played to 15 points and the teams will flip a coin for the third set and switch sides at 8 points. Adults Is there an extra cost for site insurance? No- the cost of site insurance for practices and tournaments is included in an individuals membership. Also included is a secondary sports accident policy in to cover any injuries that might occur at a sanctioned tournament or practice. Juniors Can you tell me how many feet the 12u can come in off the service line to serve It is HIGHLY recommended that all Great Lakes tournaments for the 12 and under division use what is called the "Volley Lite" ball. This is a much lighter ball that helps the younger age kids find success with serving and passing. When this ball is used there is no step in allowed. When this ball is NOT used a step in would be allowed- however a specific distance is no longer listed in the rule book. The old guideline was a max of 6'. Juniors How many Liberos can be used in a match? Up to 2 liberos may be designated on the lineup sheet at the start of the match. 1) If zero or one libero is designated on the lineup sheet, the coach may select a different libero for subsequent sets but may not have 2 liberos. 2) If two liberos are designated on the lineup sheet at the start of set one, no changes to those liberos can be made during the remainder of the match. Juniors Is there a limt to the age of a boy playing on a girls team? Boys who meet the 12 and under age definition may compete with the 12 and under girls. Boys who meet the 13 and under age definition may compete with the 13 and under girls. Boys who meet the 14 and under age definition may play with GIRLS 15 or OLDER. To find the specifics on the age definitions (dates change yearly) go to our "Publication" link - select "Forms" and then "Juniors" you can download the form to view this years dates. Adults What are the age requirements for High School seniors to play on an adult team? Junior age players may play on an adult team with the permission of a parent or guardian during the regular season if they are not a member of a Junior Club. They however are NOT allowed to compete at the Adult National Championships. Tournament Directors Do you need to have attack line extensions on all courts for Regional Competition? No- the attack line extensions are only required for National Championships events which includes Qualifiers and Bid events as well. Juniors May teams warm up with balls at the team bench or spectator walkways? No- teams are only allowed to warmup with balls during the shared warmup or when they have exclusive use of the court.